Well after some much-needed down time, holiday time, family time, I am back. Not that we ever really stop working at this time of the year, we just sort of lay low. Saturday I needed to make a few deliveries, walk Madison Avenue, visit some museums to take in some art, all as part of the rejuvenation process. It was a beautiful day weather wise, I enjoyed the air, the streets, the style. First stop was a subway station meet up with a happy client from Connecticut, who came dressed wearing nice black suede boots, put on her nice new long blue shearling and she was off, looking gorgeous! Next stop was to deliver a custom shearling jacket to Yuta Powell on Madison, just up from the Whitney. 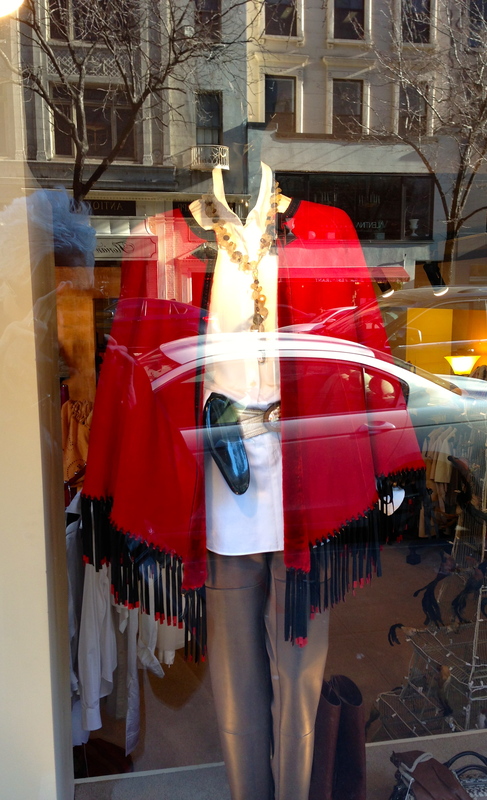 It was fun to see how Yuta styled one of our shearling vests in the store, and a Toshiki & Maryszka shearling cape in her window, even thou the reflections were a challenge for me to photograph the mannequin on that bright sunny day! After business was taken care of I walked a few blocks to The Met, to see Matisse (in full color), & then The Guggenheim for some Picasso (in black & white); by the end of the day, exhausted.